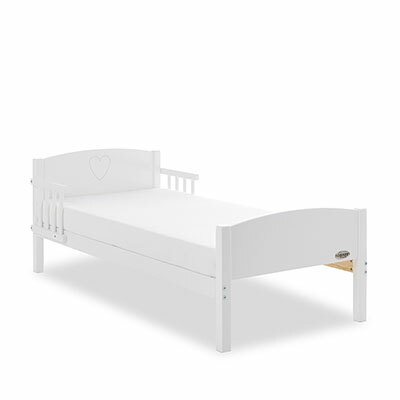 Coordinating with the rest of the Obaby furniture range, the Heart toddler bed is perfect for the often daunting transition from cot to full size bed. The engraved headboard provides subtle yet beautiful styling and its simplicity ensures that it will co-ordinate with any bedroom design. The removable side rails provide extra security for restless children and also provide an environment similar to that of a cot to put their minds at ease. Available in a range of designs and finishes, the Obaby toddler bed can be used up to approximately 4 years and is the perfect way to get your toddler used to sleeping in a bed.